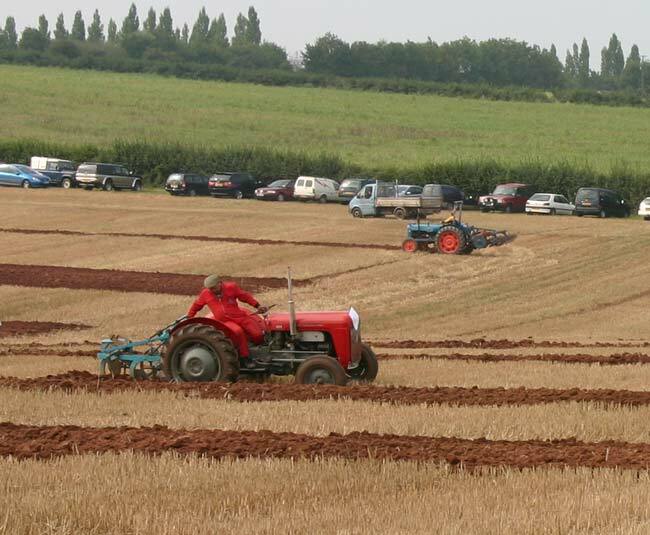 The Bridgwater ploughing match has sections for horse ploughing, vintage tractors and modern "state of the art" machinery - and, in 2005, there was a pair of steam ploughing engines in action. 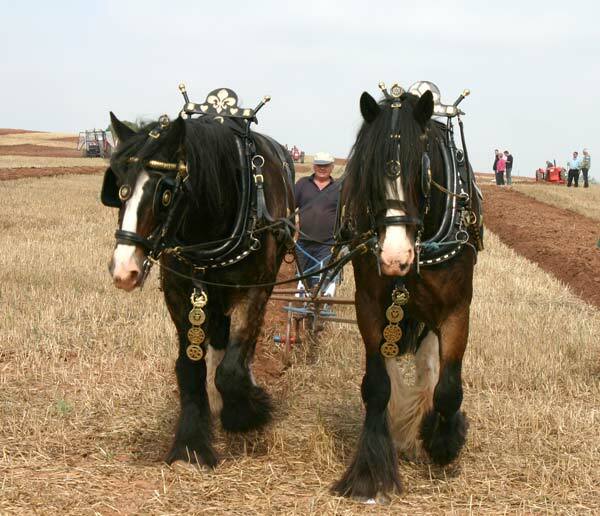 Starting with the horses and my friend Terry with his pair of Shires, Tommy and Jasper. 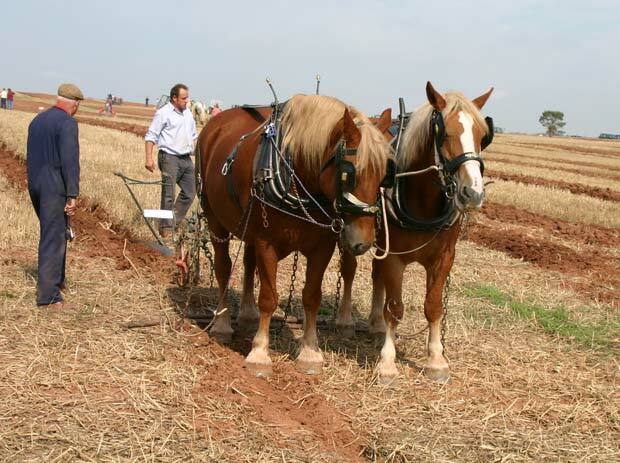 It may look leisurely from afar but their long legs take some keeping up with when you're trying to steer the plough! 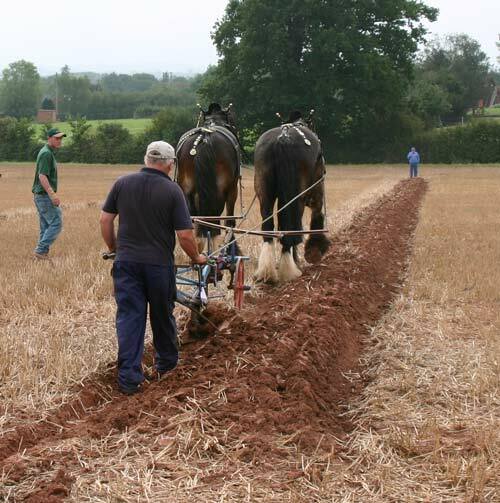 Two photos of Tommy, Jasper and Terry turning the plough before going back down the "land" as the section each ploughman has to do is called. 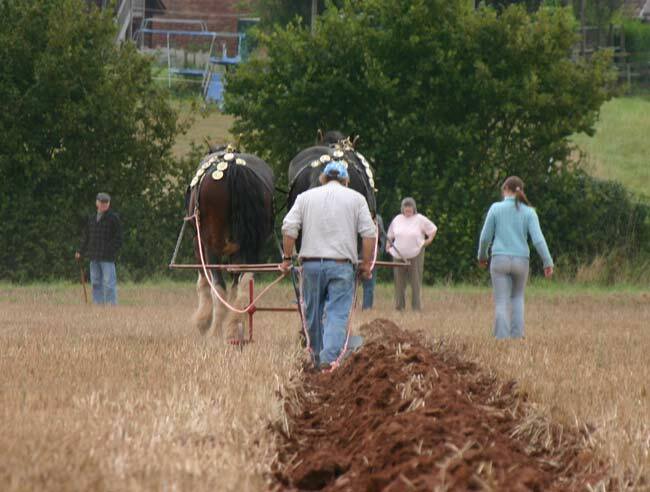 The team head off, aiming to produce a perfectly straight furrow and to cover all stubble from the previous crop. Another pair of horses coming up and then back down their land. 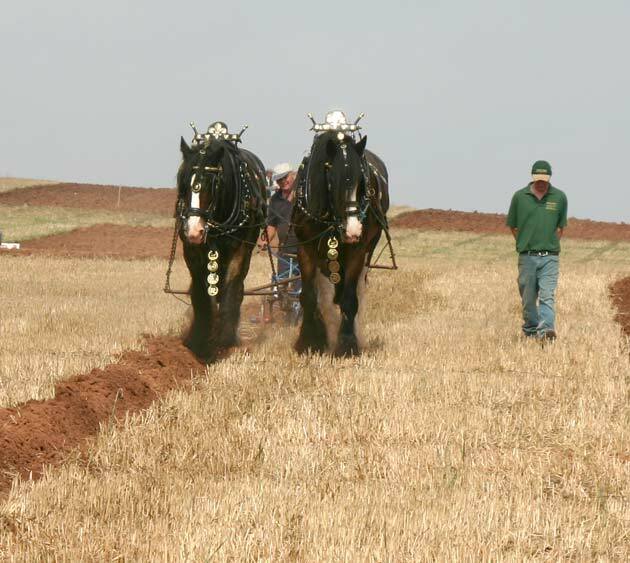 The same team making their way back up, part of the skill of ploughing with horses is to keep them at a walk, it's easier for them to go at a trot but impossible for the ploughman to control the plough! 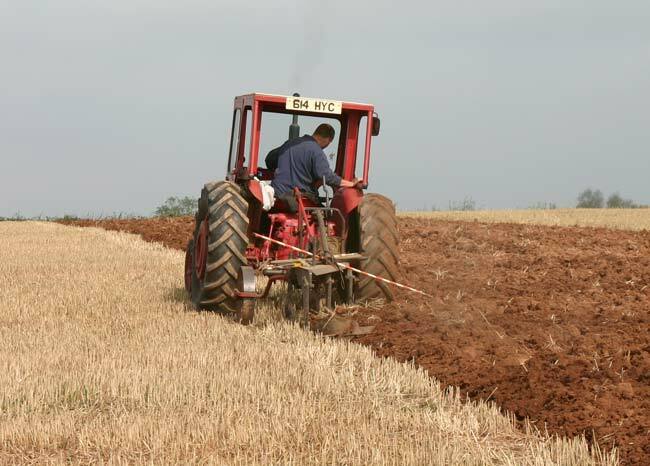 While the ploughman checks the last furrow (and gets his breath back!) 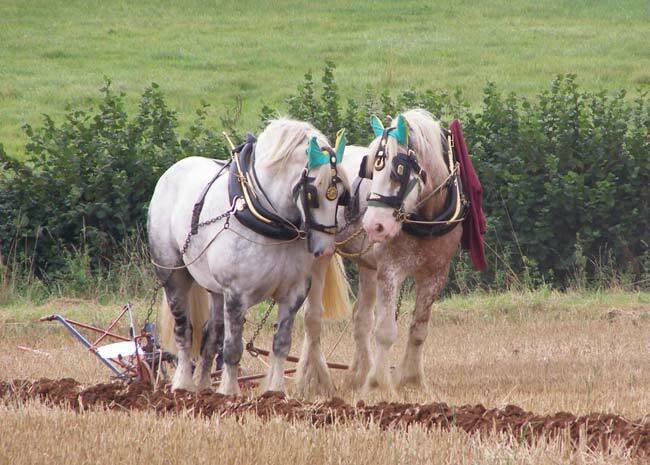 the horses have a break as well, usually standing quietly with no one with them as these two and the pair beyond are. 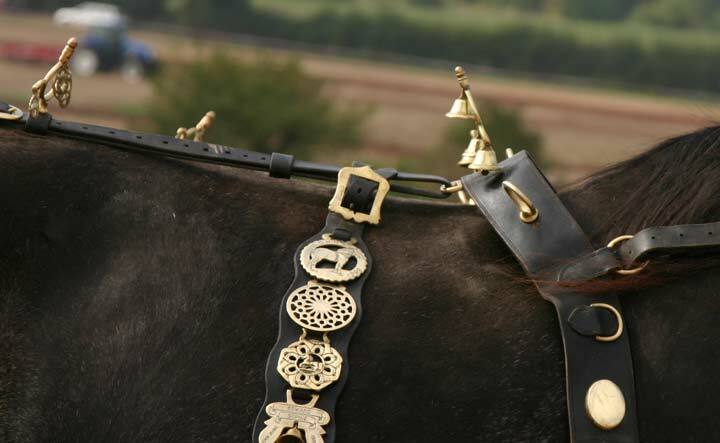 A close up of the bells and brasses on a heavy horses harness, many of the traditional designs were born of superstition and were intended to guard against evil spirits, the modern ones mark events the owner has participated in. Two more views of Tommy and Jasper - with Terry looking between them. I once saw Tommy refuse to move forward, when someone looked closely in front of him they found a Harvest Mouse hiding in the stubble! 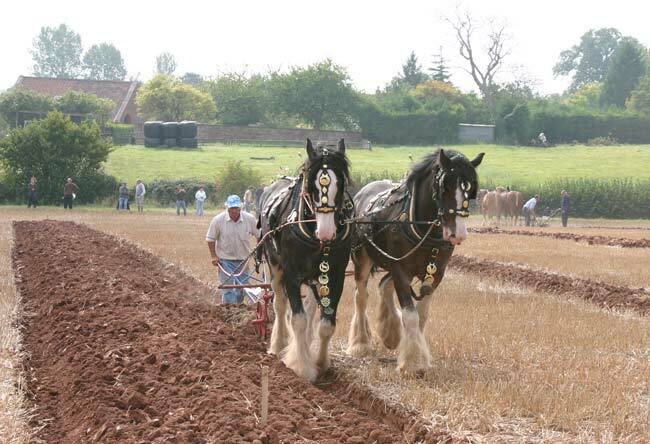 Three of the teams at the bottom of their lands, furthest from the camera is a pair of Suffolk Punches, the others are Shires - but they could be Clydesdales as the differences are minor and at one time a horse could be in both stub books! 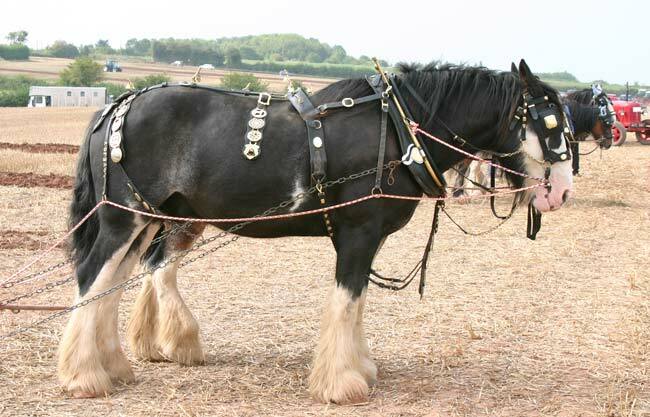 A closer look at the Suffolk Punches, they are shorter and stockier than Shires or Clydesdales and are clean legged - i.e. the don't have hairy legs! They are now an endangered rare breed so it was especially nice to see a pair at work. Another view of the Suffolks waiting patiently for the ploughman, the haimes of one's collar providing a handy hook for his jumper. This pair were also waiting patiently, looking for all the world as if they were having a quiet chat! 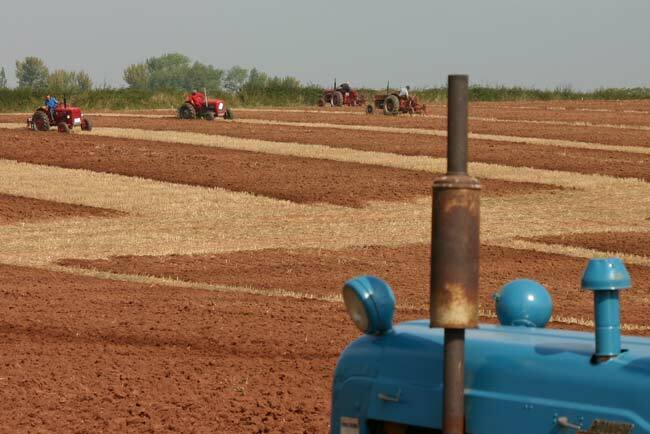 On to the tractors with this photo of a Case and a David Brown crossing as they worked their respective lands. In later years Case bought David Brown - and then International Harvester, so many names now in the past as in so many industries. A closer look at the Case showing its all metal, spiked, wheels. 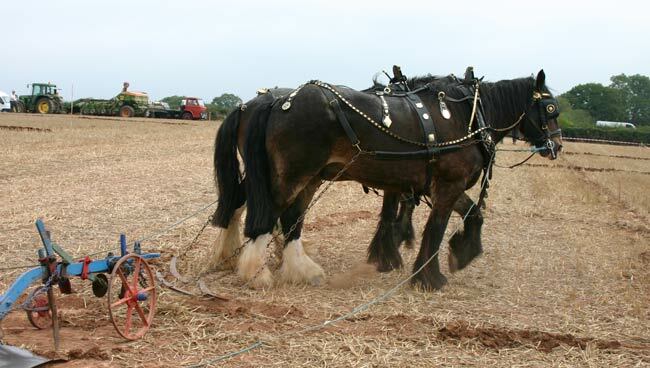 While the spikes might give good grip working in the fields you certainly couldn't drive on of these on a tarmacced road! 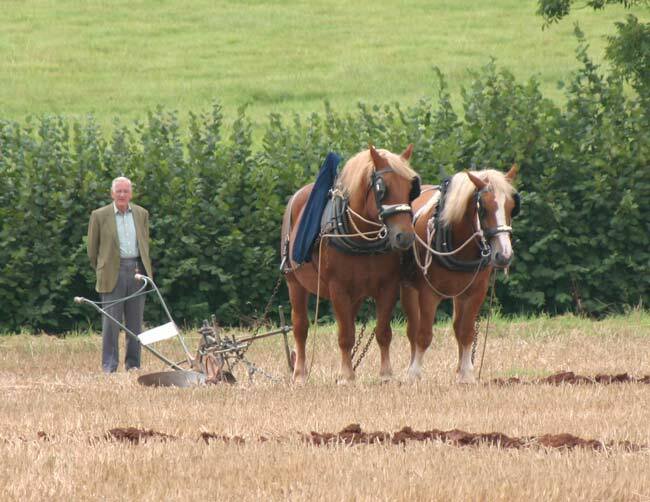 Another shot of the David Brown while the driver stopped to talk to another ploughman who was adjusting his plough - something they all spend a lot of time doing as they strive for the perfect furrow. 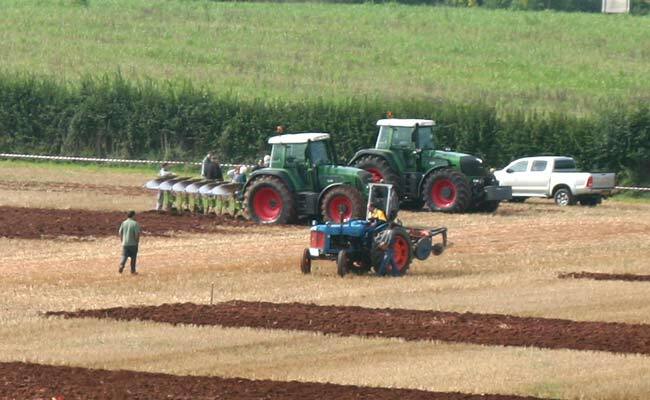 Two Internationals passing while ploughing, it is noticeable that the tractor drivers spend much of the time looking backwards and adjusting the plough. 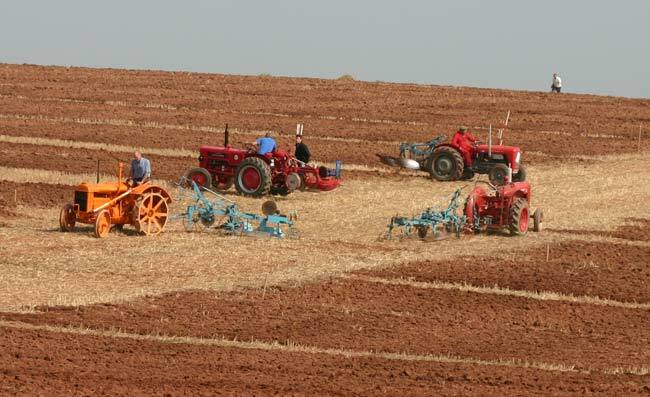 Two Massey-Fergusons and an International in action. 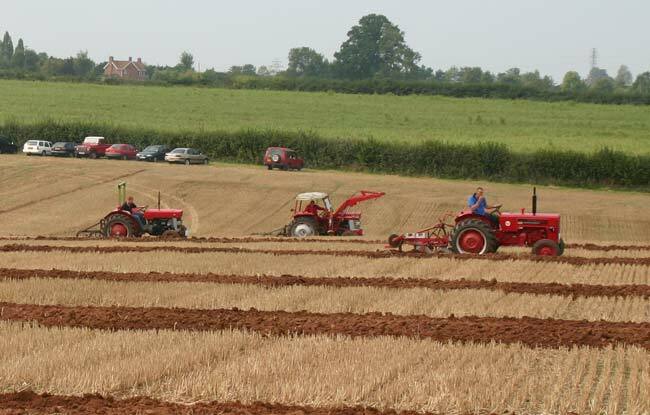 I think the nearest tractor is a David Brown with a Fordson in the background. 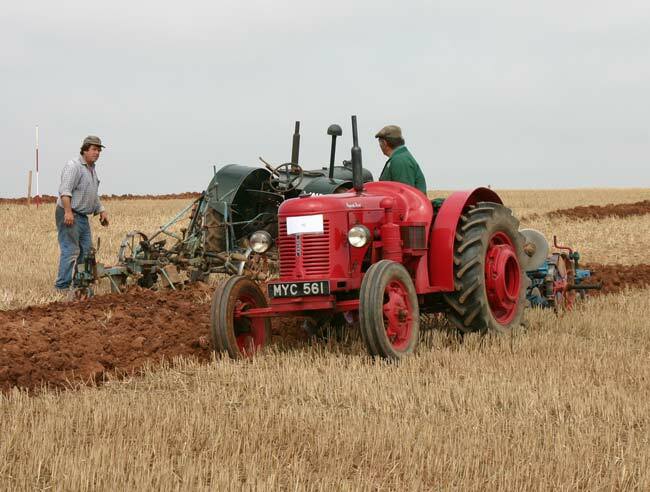 An old Fordson with a trailed plough with two of its modern New Holland descendants and a Massey-Ferguson for comparison. 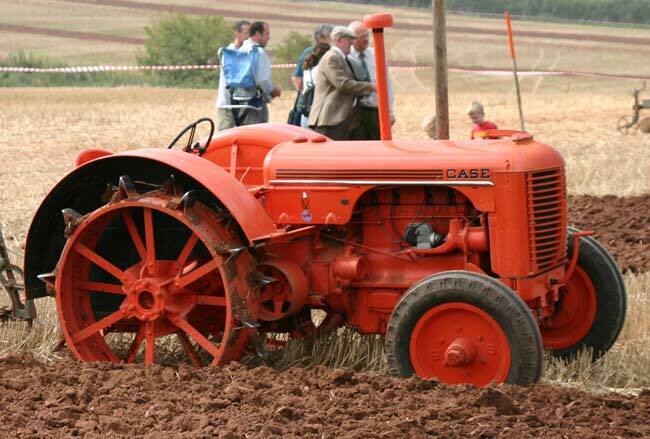 A close up of the Fordson, this like the Case above has spiked metal rear wheels but it also has all metal front wheels. 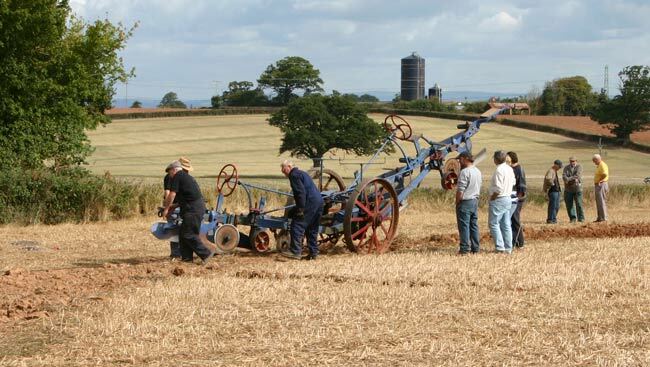 Not sure what this old machine is, it also has a trailed plough as opposed to one mounted on the three point linkage as with more recent tractors. 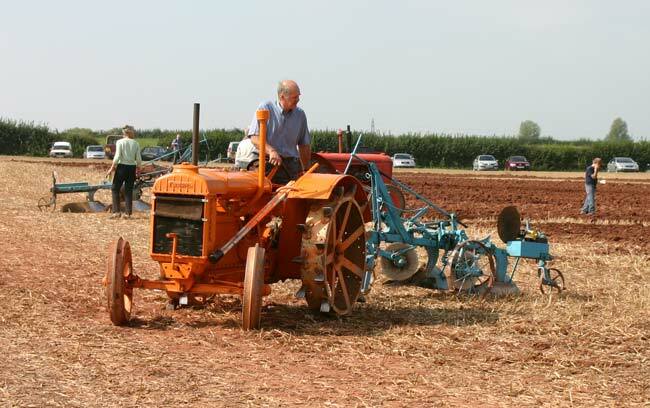 Another more recent but still old Fordson, this one is in the more familiar blue and is dwarfed by a pair of modern Fendts with their large turnover ploughs. 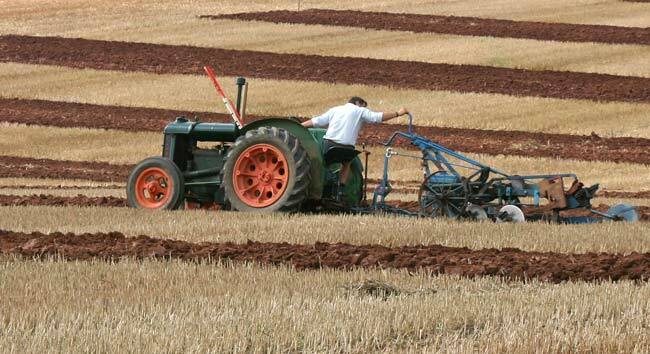 The "business end" of an International with a plough on the three point linkage which was first used by Harry Ferguson on the famed "little grey Fergies" and which revolutionised the use of tractors and the range of implements they could use. 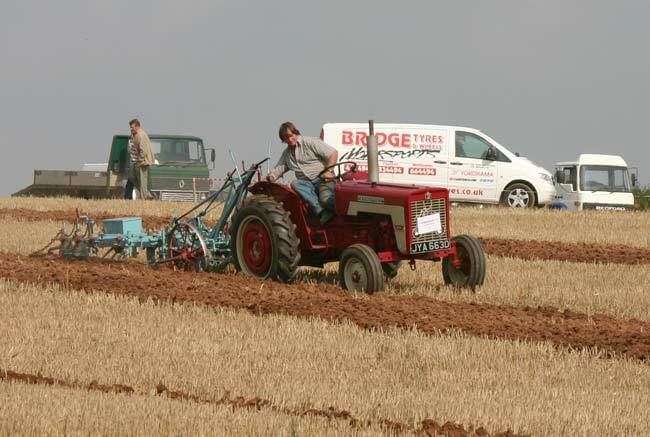 A 1966 International 434 tractor with a somewhat older trailed plough. 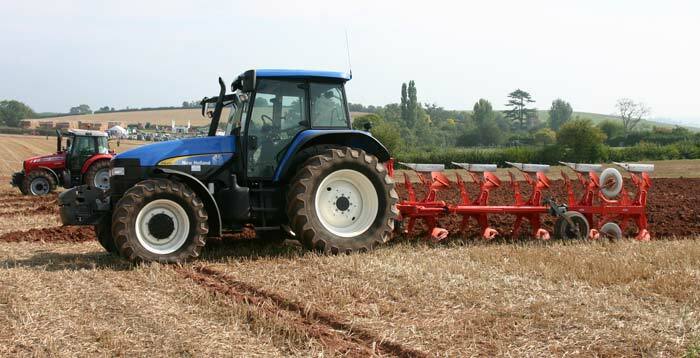 Coming right up to date a New Holland tractor with a 5 furrow turnover plough. 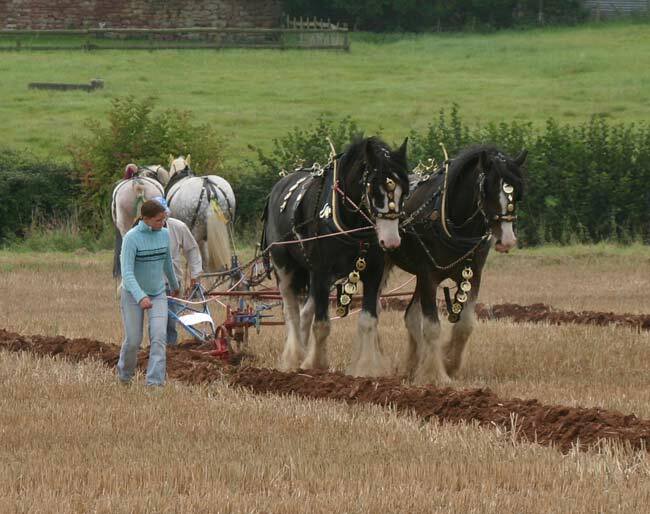 This type of plough enables the plough to go back and forward along adjacent rows while keeping the furrows turning the same way. 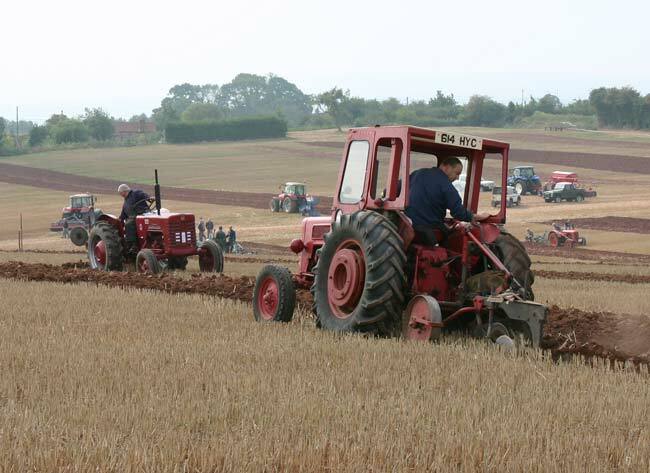 Two last photos of tractors with a variety of examples including Fordson and Internationals. 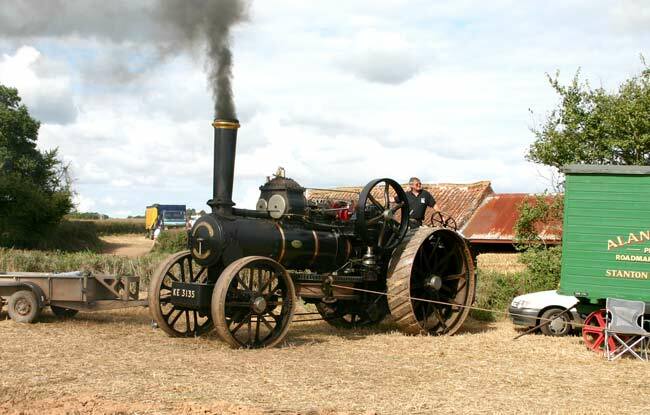 Back to 2005 and the pair of steam ploughing engines in action. 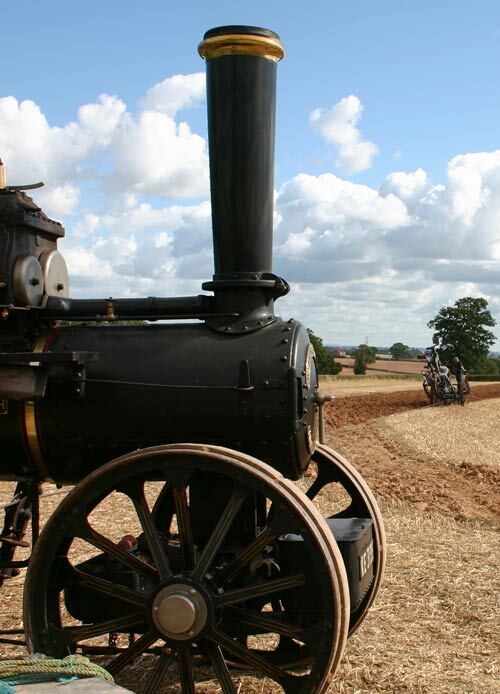 The engines position themselves either end of the field and haul the plough to and fro between them. 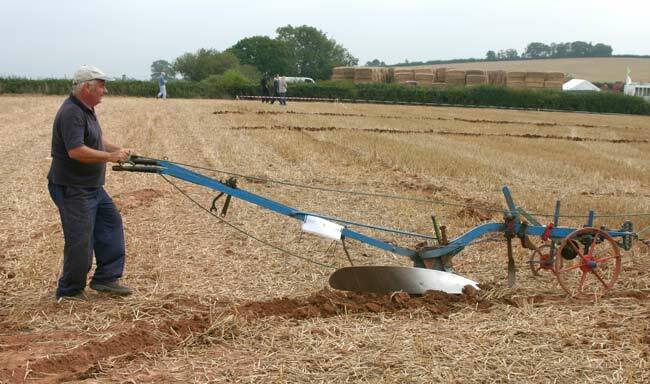 The plough itself is double ended, someone rides on it to steer it, reversing is a matter of tipping it so the appropriate end is on the ground which is being done here. 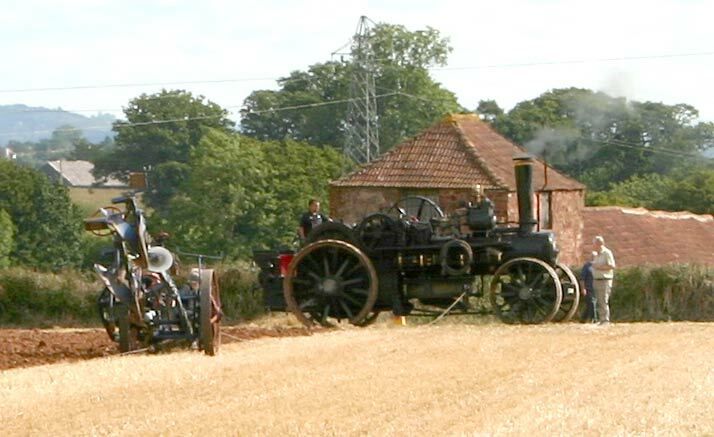 The far engine with the plough coming towards the camera. This site is ©2002-2012 S G J Huddy. Photos not otherwise credited are ©2001-2012 S G J Huddy. Other photos are included with permission of the copyright holders.